The 16 c.m. 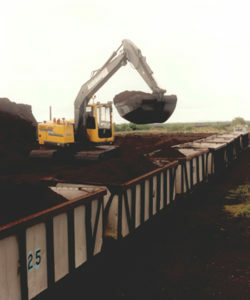 wagons were designed with two diamond bogies for sod and milled peat haulage and have given no trouble over the years. One bogie is free to float 6” (152mm.) in any direction to prevent derailment on uneven temporary track. The diamond bogie with its centre springs giving greater flexibility has prevented axle failures. The wagon bearings are grease packed taper roller and fitted in the wheel hubs. The use of aluminium alloy (I. 8 / 2.7% magnesium) sheets for the sides and floor of milled peat wagons saves 11.5 cwt. (584 kg.) per wagon and so enables an extra wagon to be taken per train. Apart from this advantage there is a considerable reduction in the maintenance painting cost.